SanDisk has revealed 60GB and 120GB G3 solid state disks, promising read speeds of up to 220MB/s and write speeds of up to 120MB/s. The SSDs will soon retail in North America and Europe for $229.99 and $399.99, respectively, and feature a 10-year limited warranty. * Long-term reliability: The 120 gigabyte (GB)* SanDisk G3 SSD can endure up to 80 terabytes (TB)* of data written to it over its lifetime. 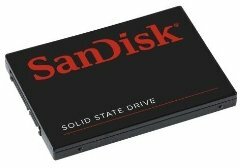 The solid state drive uses a smart flash management system called ExtremeFFSTM technology that has the potential to accelerate random write performance and thus extend the endurance of SanDisk G3 SSDs inside computers that use operating systems such as Microsoft Windows XP and Windows 7. * Rugged durability: SanDisk G3 SSD uses no moving parts, enabling improved durability that helps resist drive damage. Backed by rigorous shock and vibration testing procedures and a 10-year limited warrantyii, the drive offers some of the best-in-class quality assurance that could only come from a trusted leader in flash memory. * Fast performance: SanDisk G3 SSD opens files up to twice as fast as a 7,200 RPM HDDi, so users can enjoy faster boot-ups and improved system responsiveness. SanDisk G3 SSD has sequential performance of up to 220 megabytes per second (MB/sec) read speediii and up to 120MB/sec write speed. * Lower maintenance costs: By replacing standard HDDs with SanDisk G3 SSDs, users can defer laptop purchase costs and reduce maintenance requests associated with disk drive failure. SanDisk G3 SSD is Microsoft Windows 7 certified and is compatible with Apple Mac OS X Snow Leopard as well as Windows XP, Windows Vista and Linux. The drive also supports the newest Windows 7 TRIM feature, which contributes to a substantial gain in the SanDisk G3 SSD’s performance by allowing the drive to continuously manage its resources and retain optimized performance throughout its lifespan.